HI! Everyone hope you all are fine. In this post I will show and talk about Gmail new leaked Design and Features. 1st you tell, how many things you think have changed by comparing the below images? Here are the things which I have noticed where changed or new. 1. A drop down menu for switching through 1 Google Account to another. 2. A drop down menu to Report issues. 3. 3 links for Mail, Contact and Tasks. 5. Cell phone option in Gmail Chat. 6. 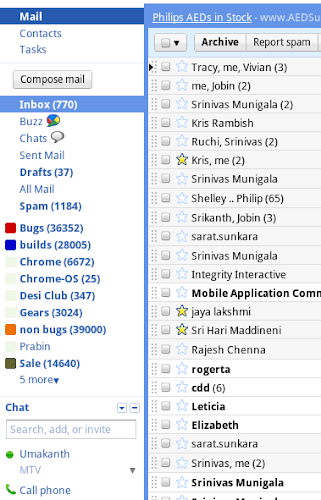 The option to starred and select the read, unread mail has got less space. 7. And seems that Buzz is pleased somewhere else or removed from Gmail. 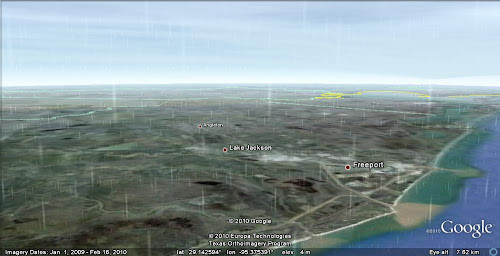 In this post I will tell you how you can see the real-time weather updates in Google Earth. In the latest version of Google Earth 5.2 you can able to view the real-time rain and snow in the certain part of the world. 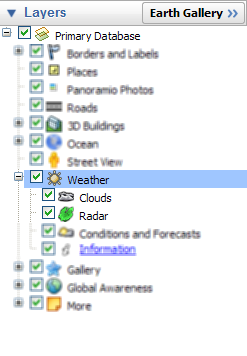 Just by enabling the cloud layer by going to the layers panel (see in 3rd image of the post) and now zoom it to the location where it’s raining or snowing. Currently Google Earth displays some area in North America and Europe. And to see where actually the rain and snow new feature displays, just enable the radar layer by going to the layers panel (see in 3rd image of the post). In this post I will tell how to create blog using blogger.com which is owned by Google Inc., it’s free, easy to use and for starters this is the best way to start with. 1. For Sign Up users. To sign up click here or go to blogger.com then click on CREAT A BLOG (for those who are already using any Google service they can sign in directly, no sign up required to sing in got to step : 2.). i) Then fill the form accordingly and click on CONTINUE. ii) Now you will see they asked you to fill another form where you will be asked to type related to your blog you want to start. (1) In 1st box type the name of your blog. (2) In 2nd box type the subdomain (subdomain is the address of your blog by which your visitors will visit your blog) you want. Before going to next step check that your subdomain is available or not by clicking on Check Availability. (3) In 3rd box fill the word verification. (4) Then click on CONTINUE. By clicking this you can start your posting, what you want to post on your blog. By clicking this you can change your template looks there you will get lots of choose by which you can customize your template (your blog looks) to know how it works Click here. Custom domain is your own domain (for e.g. : example.com or blog.example.com) where you can “buy a new domain” or “use your existing domain”. 1. To buy Click on Set Up Custom Domain or Go to: – Dashboard -> Settings -> Publishing -> there you will see written Switch to: • Custom Domain, click on Custom Domain. 2. Now chose the domain name you want. And fill the word verification box. 3. Now click on CHECK AVAILABILITY. 4. You will see a Google page where it will be written example.com is available or example.com is already registered (If it’s already registered then chose the other domain). Then click on Continue to registration. 5. Now fill the form accordingly and don’t forget to read and tick the GoDaddy.com Universal Terms of Service and Google Apps Standard Edition Agreement. If you don’t agree with their Agreement then you can’t have a custom domain from them. 6. Now click on I accept. Proceed to Google Checkout » (click only if you accept the Agreement). They will ask Credit Card details if you have “never added it before” or “it got expired”. 8. Now go through the following steps as they tell and read everything carefully. 1. To use your existing domain you need to create or change your existing CNAME record. 2. Click here to see the details how you can make or change it. There you will see its written Switch to: • Custom Domain, click on Custom Domain -> then there you will see its written Already own a domain? Switch to advanced settings, click on Switch to advanced settings. 4. In 1st box type the name of your existing domain (example.com or blog.example.com). 5. In 2nd option select the Yes or No as per your suitability (No is recommended). 6. In 3rd box fill the word verification. 7. Now click on SAVE SETTINGS. 8. Within few minutes your blog will appear in your own costume domain. (i) 1st go to the blogger dashboard were you have your old blog which you want to move to the new one. (ii) Then go to the settings of the following blog (the old one which you want to movie to new). (iii) There you will see its written Export blog click on there. (iv) Now you will redirect to a page where you can see its written DOWNLOAD BOLG click on it (now you will get an .XML file which will get downloaded after clicking on DOWNLOAD BOLG). (v) After saving that file in to your computer go to the blogger dashboard where you have your new blog, now go the settings of that new blog there you will see its written Import blog click on it. (vi) Now there you can see you have an file upload option now locate and select that .XML file (which you have downloaded from your old blog) then fill the verification box, now if you want to directly publish all your old post then tick the Automatically publish all imported posts, and if you don’t want to publish it directly just want to save it in your post draft then uncheck it. (vii) Now click on IMPORT BLOG. (viii) Now all your blog’s posts, comments and static pages are imported to your new blog. 2. For Sign In users. To sign in go to Blogger.com give your ID and Password. ii) After signing in Click here or go to Blogger Dashboard, there you will see its written Create a Blog click on there. iii) Now you will see they have asked you to fill the form to relate to you blog details. you are creating through Compose then don’t switch to Compose to HTML. You can use PREVIEW button (to view how it’s looking in your blog before posting) at the bottom beside PUBLISH button. 2. Always take a backup of your template before doing any change in your template, do any customizations in template or do any kind of changes in HTML of your blog template. To take backup your template go to Dashboard > Design > Edit HTML there you will see its written Download Full Template click on it you will get an .XML file save it (that’s the backup file of your template). And also copy the entire HTML Gadget/text Gadget in a note pad of your computer. To copy the Gadget go to Dashboard > Design from there you can copy the Gadget content and also add some Gadget to your blog.